Envirochem is proud to offer the most advanced 480 volt explosion-proof hot/cold pressure washers engineered for offshore and land rig locations. With our customer’s safety in mind and striving for a successful completion of each project, Envirochem builds to standards which far exceed current industry standards. Envirochem also has one of the only engineered four part directional pad eye lifting system on pressure washers in the Gulf Coast Region. Our units have many other safety features such as a fully-enclosed belt guard system, 5000psi pressure rated wash hose, forklift pockets to prevent sliding, pressure regulated pumps, and explosion-proof components to meet the NEMA 4 and NEMA 7 regulations . All washers have a 10 hp motor. The heaters on these units are set to 150 degrees and controlled with a high temp shut off valve. Each heater is wrapped with a stainless steel mesh to protect users. Our pressure washes require a 100 amp breaker to operate. Each unit comes with a soap injector which can be used with Envirochem’s EC-6 degreaser to further assist the cleaning process. Each washer is equipped with a “not in use timer.” In the event the unit is not used in 15 minutes, it will completely turn off. 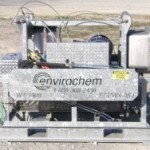 All units have been pull and mass particle tested and sit on an engineered fabricated skid. All certifications and testing documents are available per request. Each units comes with 150′ of power cord, 100′ of hose and (2) 4′ wands. We also have 6′ wands and additional hoses available upon request.